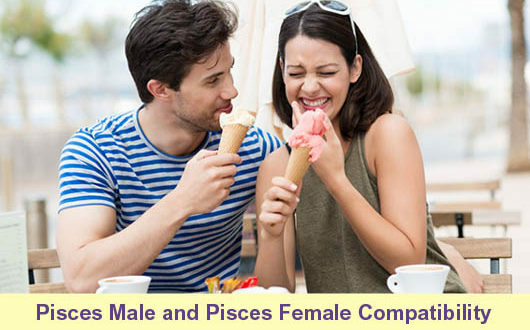 Pisces and Pisces sign combination can be a very interesting challenge. Usually, this relationship may quickly go from one extreme to another, meaning it may turn into one of the best matches or end up as a nightmare. An extremely emotional and intuitive, both partners are very devoted and loyal lovers. They share a beautiful partnership, full of mutual understanding, peace and harmony. Everyone admires their great communication and deep emotional and spiritual bond. Love is the most important thing to them, it comes first, last and always. Both partners are equally committed to each other. They both hate too much structure or limitation, and both tend to follow their instincts rather than facts. This couple faces little or no conflict and shares a deep admiration of one another. Pisces possess a huge heart and a great deal of empathy and compassion. As they tend to be slightly frightened by the big, harsh world, they often create an illusion around themselves and thus feel secure together. The outside influences are the only thing that can hurt them, never one of them. Therefore, as long as nobody interferes in their love nest, they will enjoy their treasured union. However, it is exactly this illusion, this dreamy world they create, that usually destroys their relationship. When things get out of their control, Pisces often get confused about whether to follow the outside world or stay in their fantasy. Here is where they will do anything to avoid confronting with the problem, and rather hide being unable to find a way out. They are extremely vulnerable, easily hurt and often powerless. When trouble hits them, they are unable to deal with it. Also, while the two Pisces are so emotionally dependent on each other, there is a great risk that they will get lost in all the emotions or wander off too far in the spiritual direction, and thus lose their own identity and their sense of self. When it gets rough, these sensitive partners may become depressed in such an extreme way and in that respect they may bring out the worst in one another.